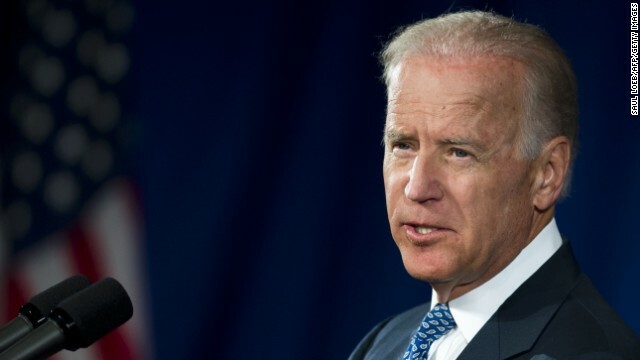 Biden, speaking at a forum in Washington spotlighting working families, said he had "a great pension and a great salary" but still understood the various challenges working parents confront. "I can speak a little bit from my own experience," the vice president said at the White House Summit on Working Families, adding he realized there might be skeptics who question his empathy. "The first thing you're going to say is, 'Look at Biden, man. He's got a mildly expensive suit on. He's Vice President of the United States of America. He makes - notwithstanding that he is listed as the poorest man in Congress - he still makes a lot of money as Vice President of the United States.' And I do by the way." "Don't hold it against me I don't own a single stock or bond," Biden continued. "Don't hold it that I have no savings account." Biden does, in fact, have savings accounts listed on his most recent financial disclosure form, which was released in May. The form, filed jointly with his wife Jill, indicated accounts holding between $1,001 and $15,000 at the Senate Federal Credit Union and the Wilmington Savings Fund Society. It also included two certificates of deposit valued between $50,000 and $100,000. The same form also lists various investment funds of different values, which are held in his wife's name. Biden's comments came the day after Clinton suggested she and her family weren't among the nation's wealthiest since they pay high income taxes. Clinton was explaining why she could be a strong advocate for combating income inequality, despite her personal wealth. "They don't see me as part of the problem, because we pay ordinary income tax, unlike a lot of people who are truly well off, not to name names; and we've done it through dint of hard work," she said in an interview with The Guardian. The remarks came two weeks after Clinton defended her slate of paid speeches by claiming she and her husband, former president Bill Clinton, left the White House in 2001 "dead broke." The comments prompted critics to denounce the former secretary of state as out of touch with ordinary Americans, and led to some comparisons to Mitt Romney, the millionaire 2012 Republican presidential nominee who was lambasted for being tone-deaf on his wealth. For his part, Biden has long remarked on his modest means. During a 2007 campaign stop in New Hampshire he told primary voters, "I don't own a single share of stock." Later, when he joined then-Sen. Barack Obama on the Democratic ticket, he acknowledged "I make a good salary" but was still among the poorest members of Congress. "I'm not proud of it," he said then. "I'm not proud of it. But that's what happens when you get elected when you're 29 years old." Only the Democrats can make it possible for a republican to win in 2016. Hillary Clinton and Joe Biden could make it easy for the GOP to slip in the door. I think Biden has done quite well considering his intelligence. Right ? The dems are broke and just want to give us a line of bull on the best way to spend our money all the time boy . Well i know how about lets send 280 milliiion to south america instead of a fence ? Lets shut down coal fired power plants before we replace them with something new and cost them dumb citizens more and effect the bottomline make um scream ? Lets make them pay more for healthcare lets make them pay for B control and abortions like it or not and if they dont we will send the irs ? There is nothing wrong with being wealthy. I'm sure most of us would like to be. However don't look down your noses at people who are less fortunate. Pay your taxes like a good citizen. Too bad the average person can't get close to the tax breaks the wealthy do. lol, shut down coal power plants. It was a regulation to limit the amount poisonous emissions being piped out of coal plants. The fact is the technology exists to limit these emissions, but these businesses are not using them because it will cut their profits by a few percentage points. The key word here is profits. American corporations need to realize the goal is to operate in the black, not operate in an ever increasing profit margains, where making a profit, but less than your last quarter profit is a fireable offense. It just is not possible or healthy for the economy for business to grow their profit margain forever. They're stepping into their own trap of demonizing the wealthy. Just a matter of time until Hillary and Joe go after each other's throats... Can't wait for the fireworks!! !